It's been nearly two years since my amazing aide and I started genre-fying our library's fiction section. While it was a TON of work, we have never regretted it. 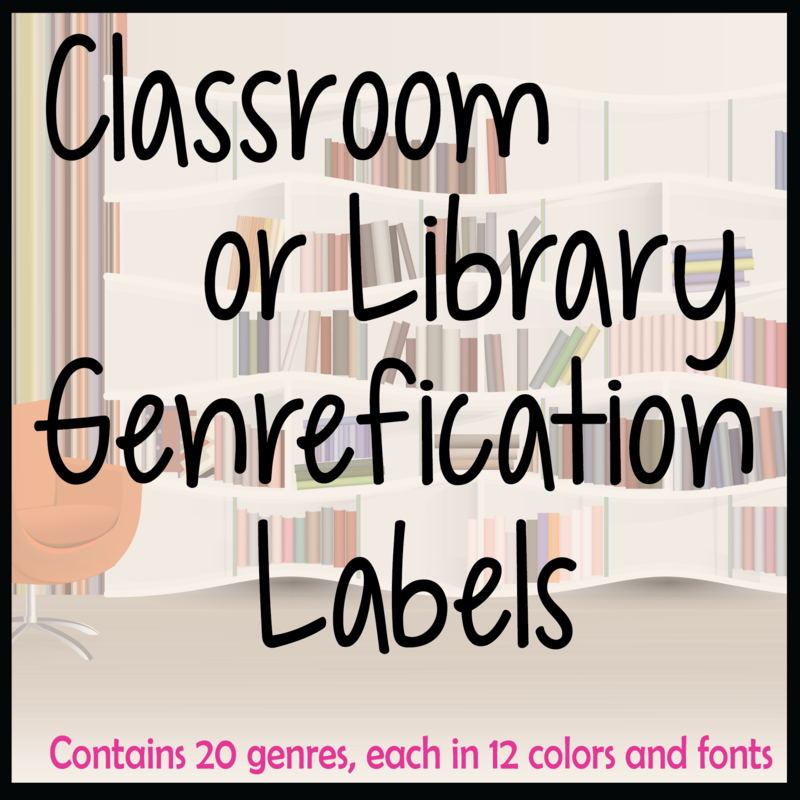 Since then, I have helped guide other area librarians in their own genre-fication projects and continue to spread the word about this wonderful new way to help readers find the books they love. Our school opened its doors in August 2009. The low circulation in 2009 is partly due to the fact that our Destiny system was not set up until about 6 weeks into the school year. Yes, we checked out manually for 6 weeks--not fun. Though the 5,090 circulations number is only for mid-October through December, it's still disappointingly low. The only thing we did differently in our library between 2010 and 2011 is genre-fy the fiction section. Our library schedule has remained the same, and we are open for the same amount of time as we were in 2009. In 2009, our total student enrollment was around 800. In 2012, we are right around 850. This 6% increase in student population will account for a small increase in circulation. Clearly, genre-fication at my school has been a huge success. We have gotten nothing but positive feedback from our teachers, administrators, other librarians, and most importantly, our students. I especially love it when students new to our school exclaim how "cool" our library is or how easy it is to find good books. As if that were not enough, shelving color-coded books is infinitely faster and easier. Plus, we can tell at a glance if a book is shelved in the wrong section. Bonus! Have you genrefied your library? Still on the fence? I would love to hear your comments and/or concerns! Your posts on genrification are so helpful, as I am currently genrifying a primary school library in Hong Kong. 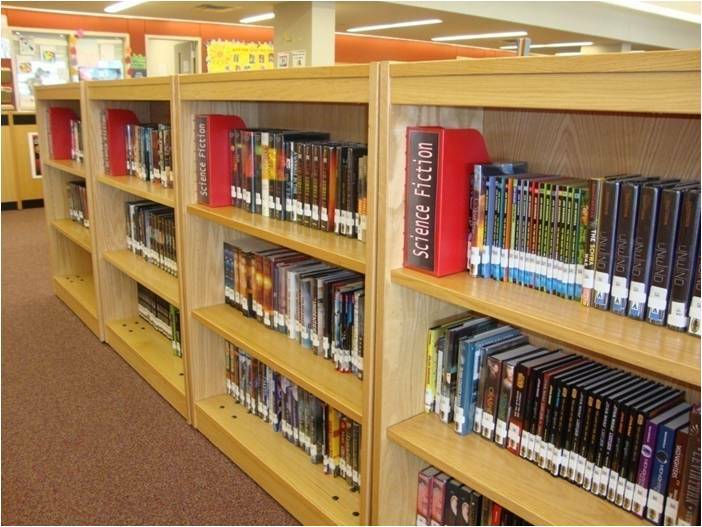 My question is physical placement of your books at different reading levels, that is, your YA, J and EJ books. Do you put all Realistic Fiction books under all three levels together, and students can choose whatever reading level they want? Or do you have Realistic Fiction in three different parts of your library? Many thanks! Hi, Annie! Well, this isn't an easy question to answer. I've genrefied two libraries: one middle school and one MS/HS. In my current library (the MS/HS), I have all the levels of the book in the one genre section. Books with more mature content are labeled with KS4+ (high school) on the spine. If you are adding elementary books to that, then I guess it would depend largely on your space. Do you have room for all those sections? If you did not genrefy, would you split Fiction into the 3 levels? If yes, then I think you should genrefy the same way. If your space is limited, maybe you could just use a smaller number of genres. I'm sorry I don't have a great answer on this one--maybe someone who has done it will chime in. Hi Leigh: Thank you for your quick reply, very much appreciated and super helpful. You've directed my attention to space allocation, and therefore makes more sense in my case to keep all levels together under one genre section. Before genrifying, Fiction was not split by levels; it was one big alphabetical collection that was left to gather dust on the shelves. I think I will put all genrefied picture books in one section, and then label chapter books by levels but put them altogether in another section. I also use your new books updates to stay abreast of new publications to order for our library. Thank you for your dedication and good work with this wonderful blog! I think this sounds like a good solution. Very happy to help!